royal observatory – Sunshine. Whimsy. Tacos. 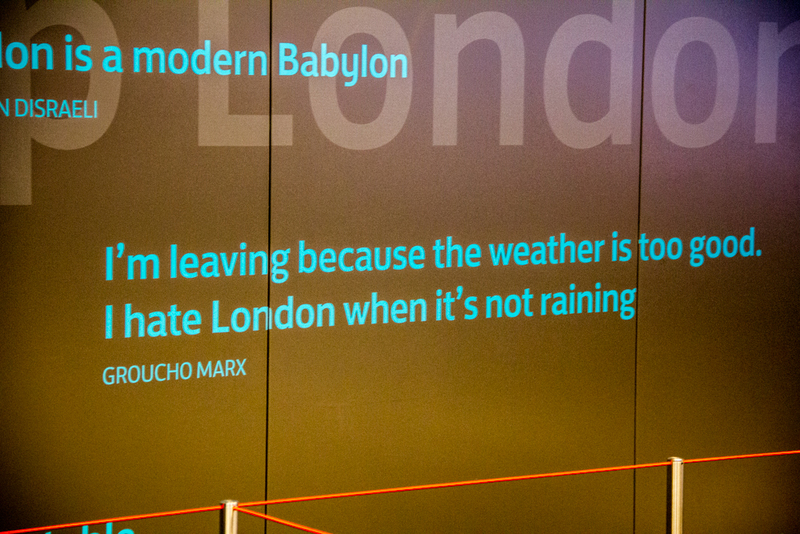 In keeping with my tradition of going to London every July, I went there last weekend. This was a short trip- I flew in on Friday night and out on Sunday evening. However, I ran into some issues with Heathrow. My 9pm flight got into Heathrow an hour and ten minutes late. I’m lucky it wasn’t cancelled entirely. We waited twenty minutes for Heathrow staff to find someone to drive the jet bridge out to the plane. We waited another twenty minutes for the little people mover that takes you from the gate to the arrivals area. Lots and lots of people had no luggage, or had to go back throughout the weekend to try to get their luggage back. I’m grateful I’ve taken to flying without checking a bag for short trips. We got to the main arrivals area of the terminal after the last Heathrow Express train to Paddington Station had already left. Luckily, they added two additional trains when they saw the delays stacking up. One departed at 12:45, and one at 1:30. I waited another 50 minutes for the 12:45 train. If you’re doing the math from the bolded text above, you’ll spot that we got to Paddington after 1am, which means the London Underground was shut down for the night. 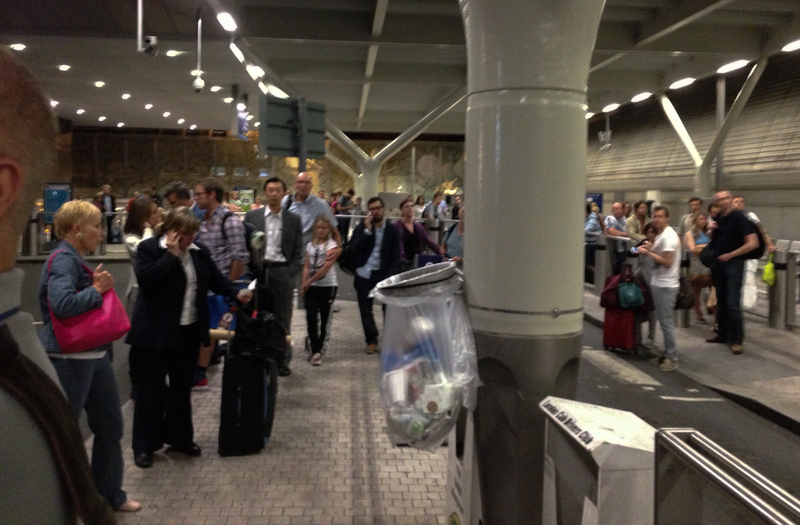 The picture below was the line at the taxi stand at Paddington. I considered walking to my hotel, but that would have involved cutting through Hyde Park at night, and I wasn’t feeling up to that particular challenge. After my first experience with a legendary London Black Cab, I reached my hotel and made it into bed by around three in the morning. My weekend was off to a rollicking start. Saturday morning, I went to The Shard. The newly constructed tallest building in the European Union was not open to the public yet when I was in London last July, and I couldn’t resist a climb to the top. Tall stuff! The climb was actually one elevator to the 33rd floor, then another elevator to the 68th floor. 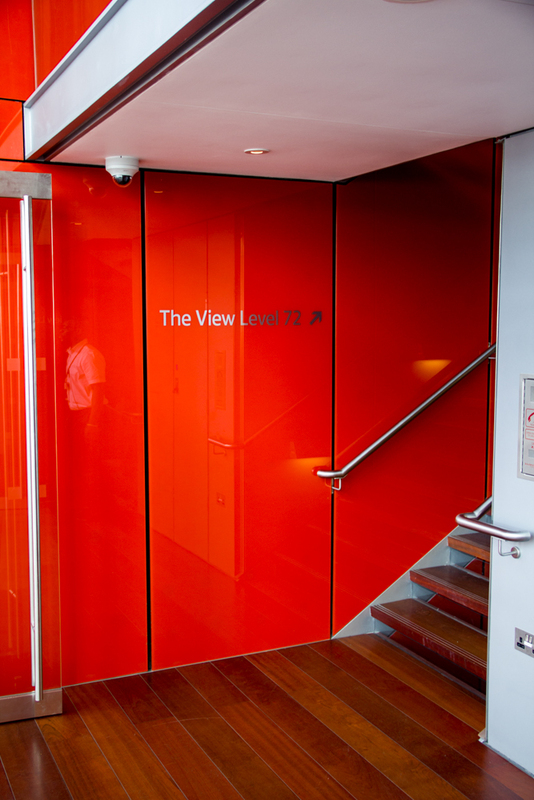 From there, a short stair takes you to the first observation level at the 69th floor, and another set of stairs takes you to the open observation on level 72. There’s more above that, but only for private functions. This is the mostly-open observation level at the top. 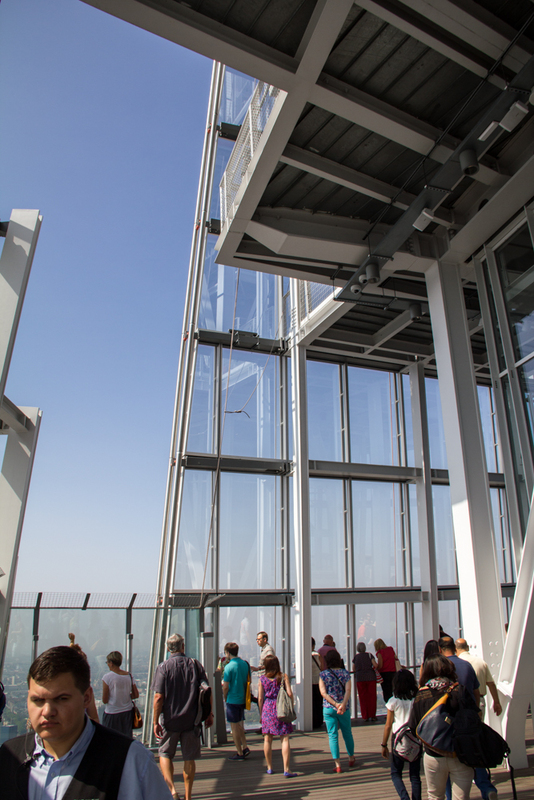 …and three pictures of the View from the Shard, which is coincidentally the name of the tourist attraction portion of the building. 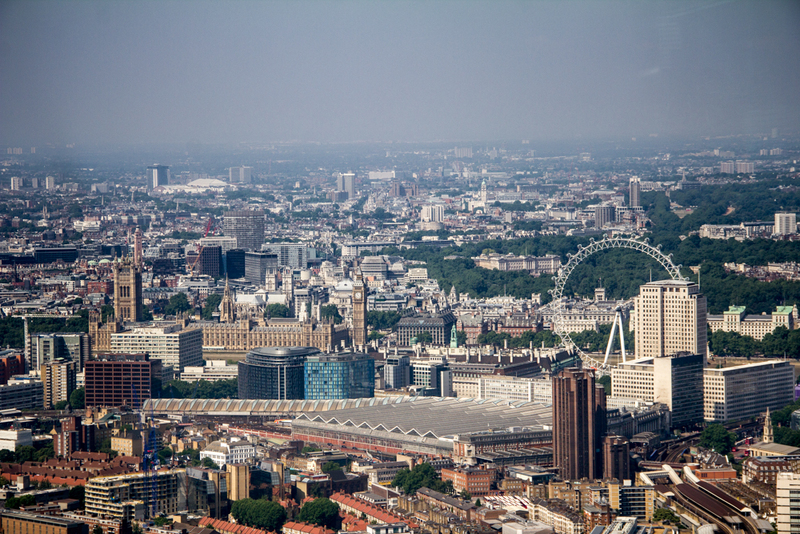 The first picture includes the London Eye, Big Ben, and the Houses of Parliament. 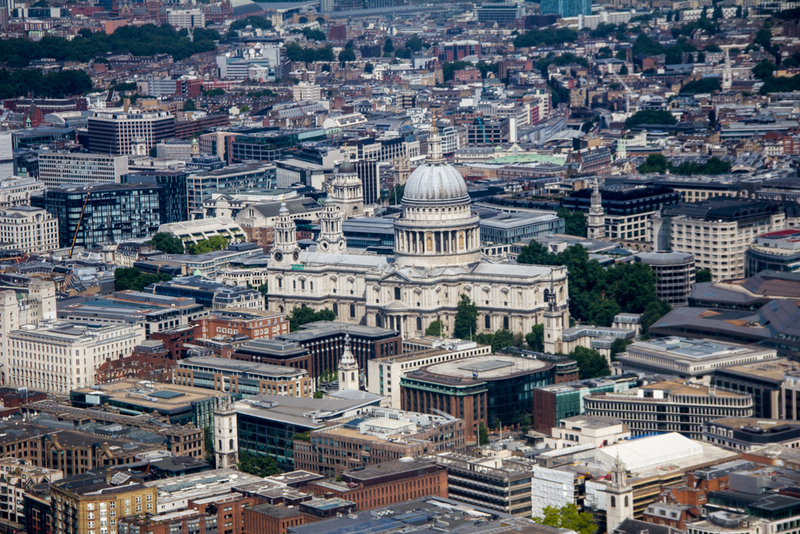 The second picture includes St. Paul’s Cathedral. 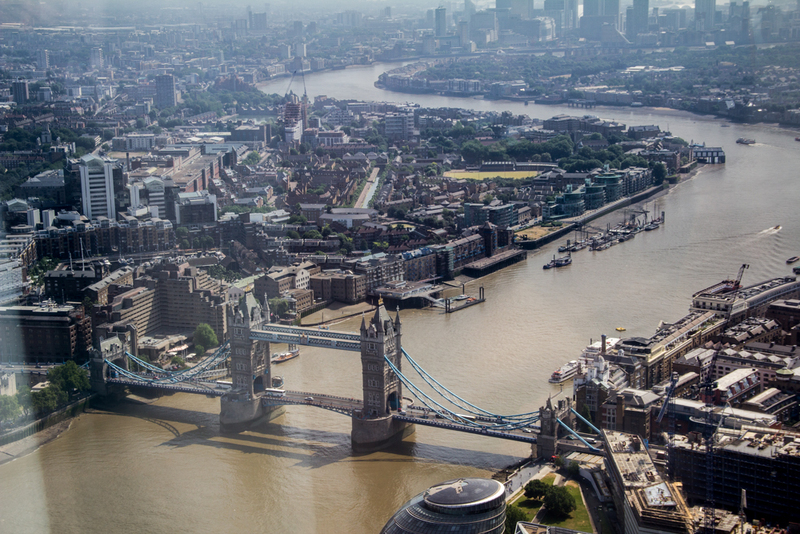 The third includes the Tower Bridge and part of the Thames River. 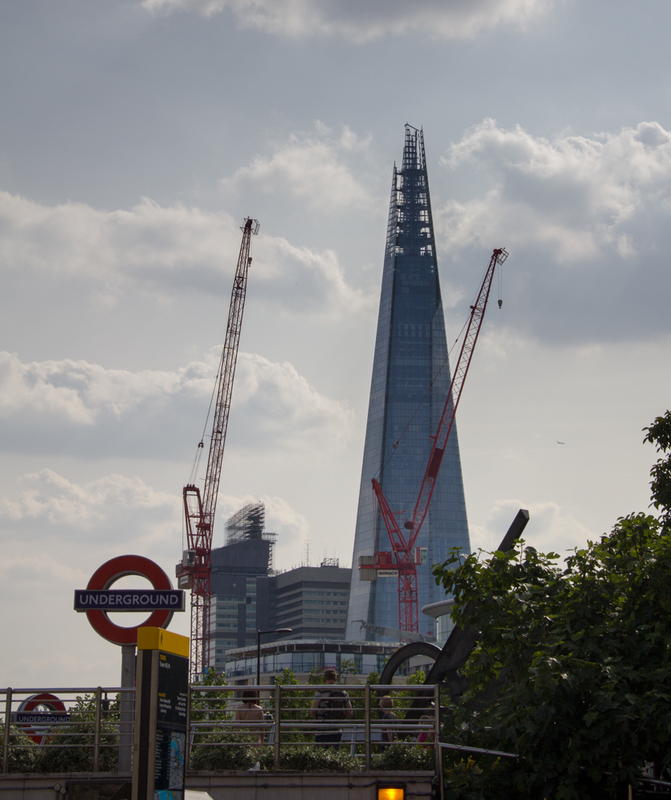 After I left the Shard, I went on the Tube to meet a friend for lunch. My weekend of rough travel continued, as parts of the Tube were shut down for maintenance work and I had to go in a very roundabout way. 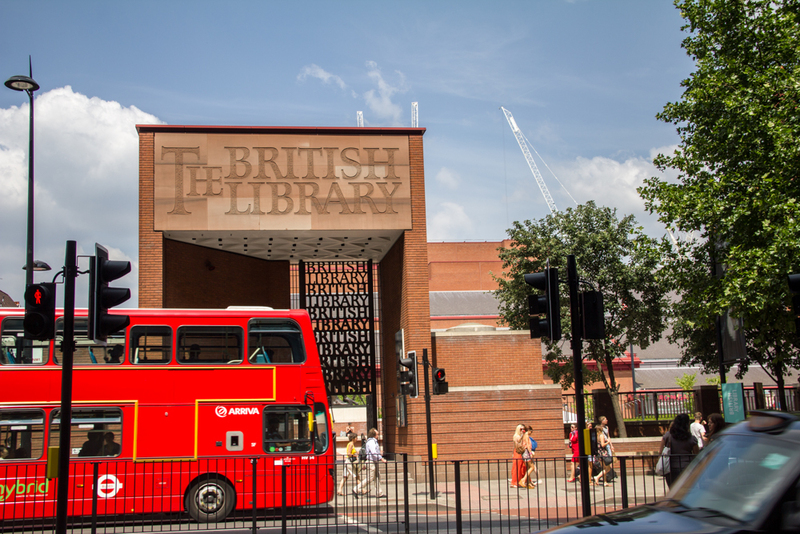 I made it, eventually, to the British Library to meet Neo for Lunch. 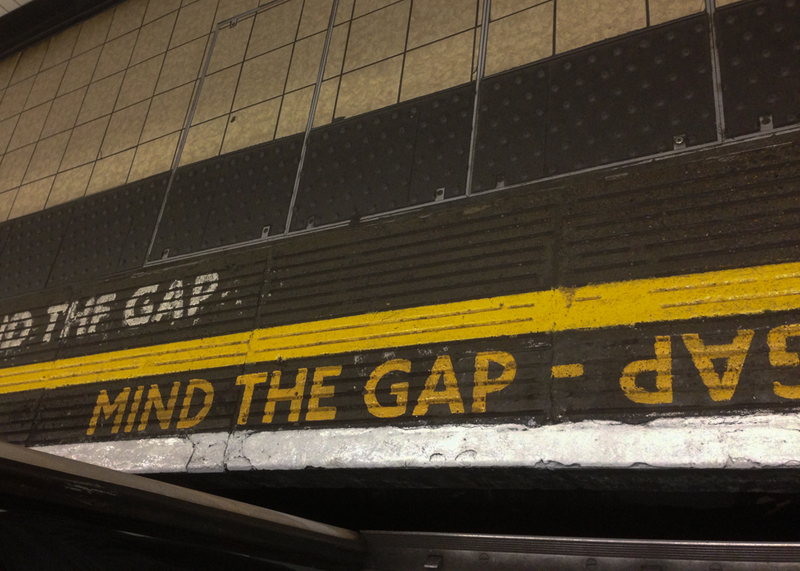 That’s not code for anything, it’s just where we met before grabbing a bite to eat. Hanging out with friends is always a delight, and I love lunching with people. After lunch, I made my way to the DLR trains from Tower Bridge to go over to Greenwich. When I was there last July, I couldn’t reach the Royal Observatory because of the Olympic Games, and I really wanted to check that out. On a nice warm day like this, so did a lot of other people- the lawns of Greenwich Park were littered with sunbathers and picnickers. The Observatory is waaaay up that hill to the right It was a nice walk. 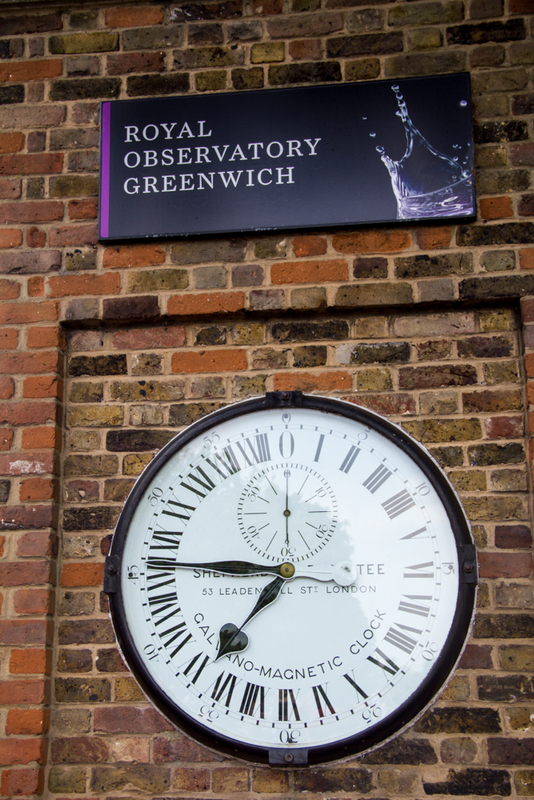 The Royal Observatory is great for people who like to geek out about time, clocks, telescopes, astronomy, and so forth. There are a lot of nifty clocks about, like this one. The museum section also had a lot of amazing telescopes and spyglasses and so forth. I took a lot of pictures, but I’m not going to put all of them up here. 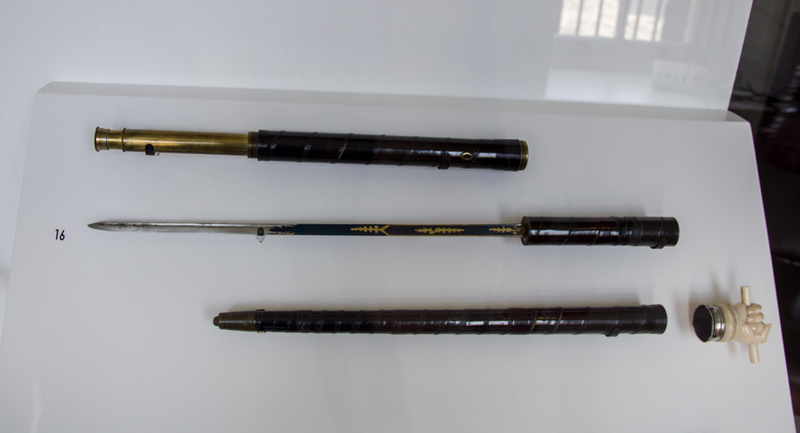 Instead, I chose this spyglass to represent the coolest of the cool: It’s a walking stick/sword/spyglass. So cool! Of course the reason that most tourists go to the Royal Observatory is to stand on the Prime Meridian, with one foot in the East and one in the West. There is also a monster laser in the Observatory that they light up at night- a bright green laser beam shows the path of the Prime Meridian for roughly fifteen miles on a clear dark night. I’d like to see that some time. After I was done at the Observatory, I doubled back to the hotel to change clothes for the evening. When I got out of the Tube at Earl’s Court, I found this right outside the station. 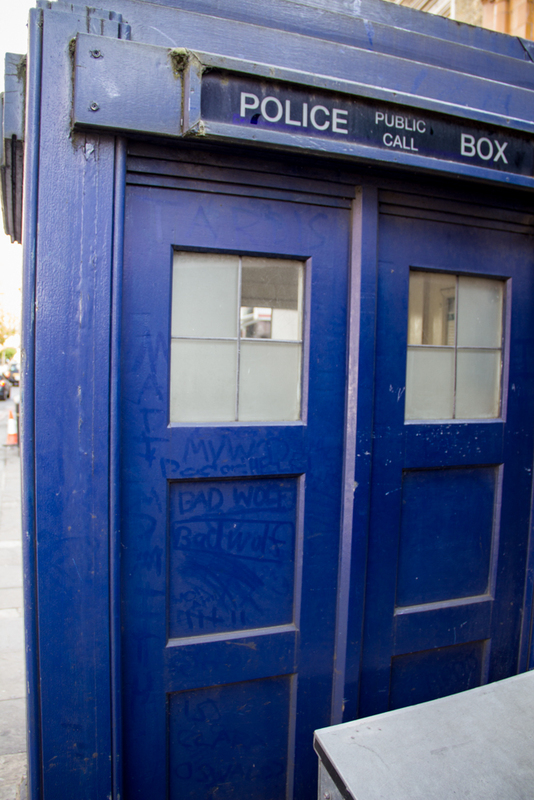 The “Bad Wolf” and Clara Oswald notes were already scrawled into the dust; I didn’t put them there. Finally, Saturday evening had arrived, and this is what brought me to London for this trip: BBC Prom #2. The 50th Anniversary Doctor Who Prom. 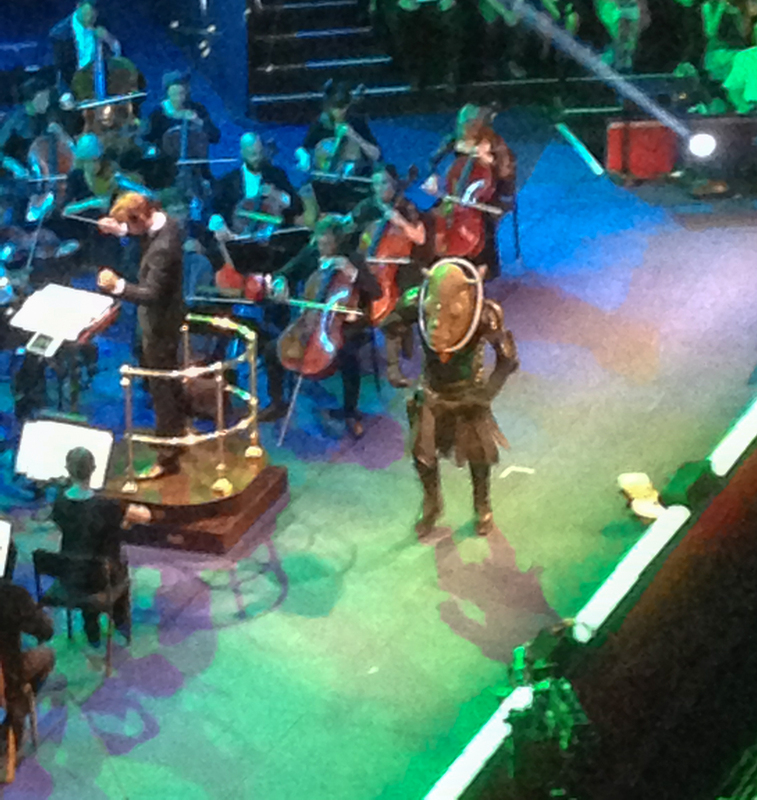 Doctor Who At The Proms has occurred twice before, in 2008 and 2010 respectively. I had been waiting for it to come up again since I got to Germany, and I wouldn’t have missed this for the world. 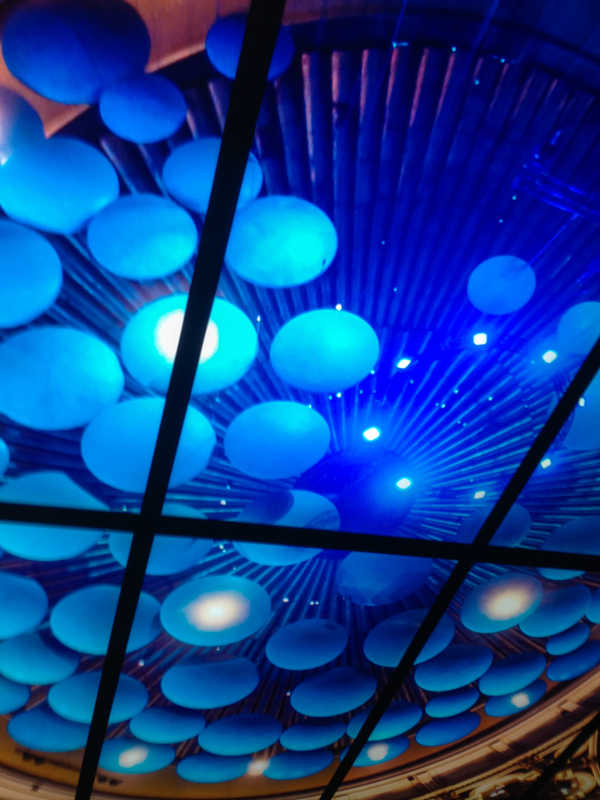 The Proms were recorded live, and will be aired on the BBC during the 50th Anniversary celebrations later this year. 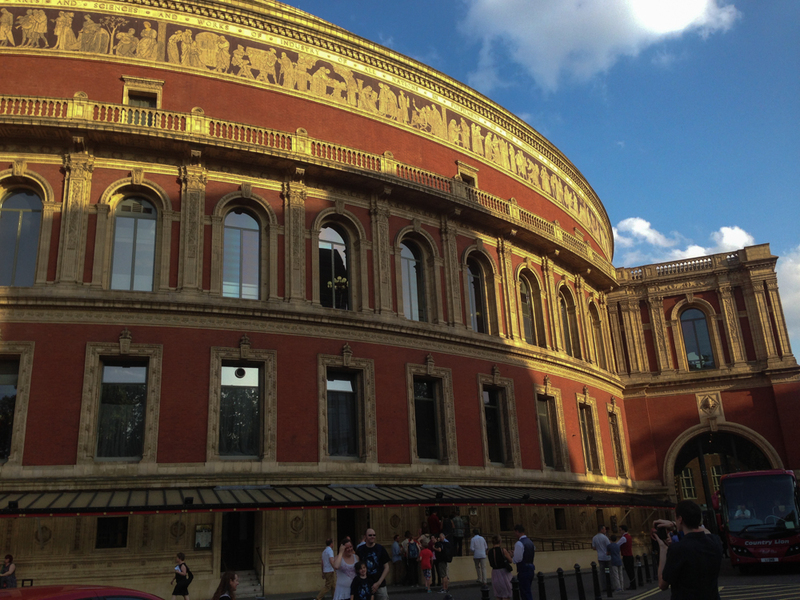 In any case, here’s the Royal Albert Hall. 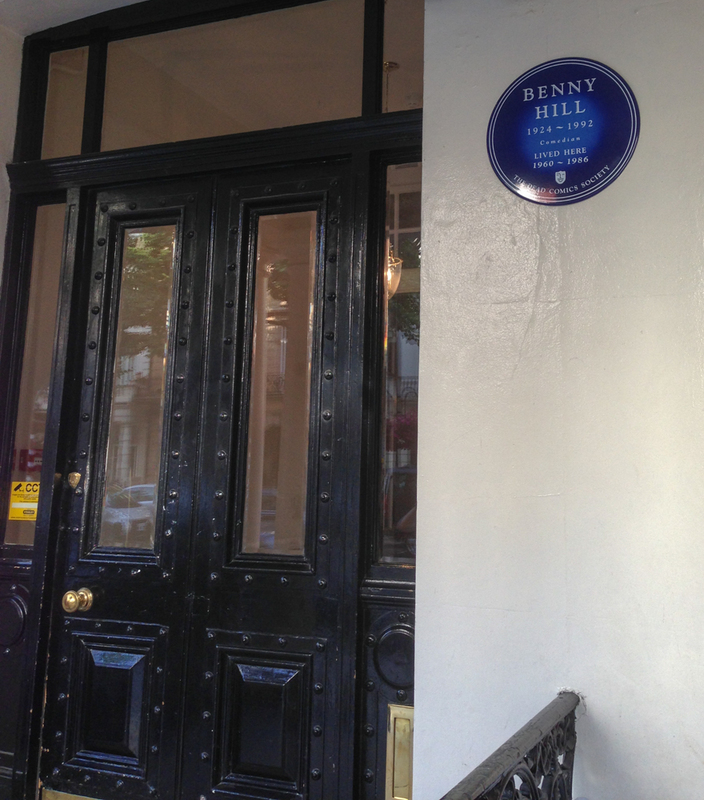 The walk between my hotel and the Royal Albert Hall went up a long street filled with various embassies. At one point, I saw some guys taking a picture of a doorway, and I got a little curious. This is what they were taking a picture of- cue Yakety Sax! 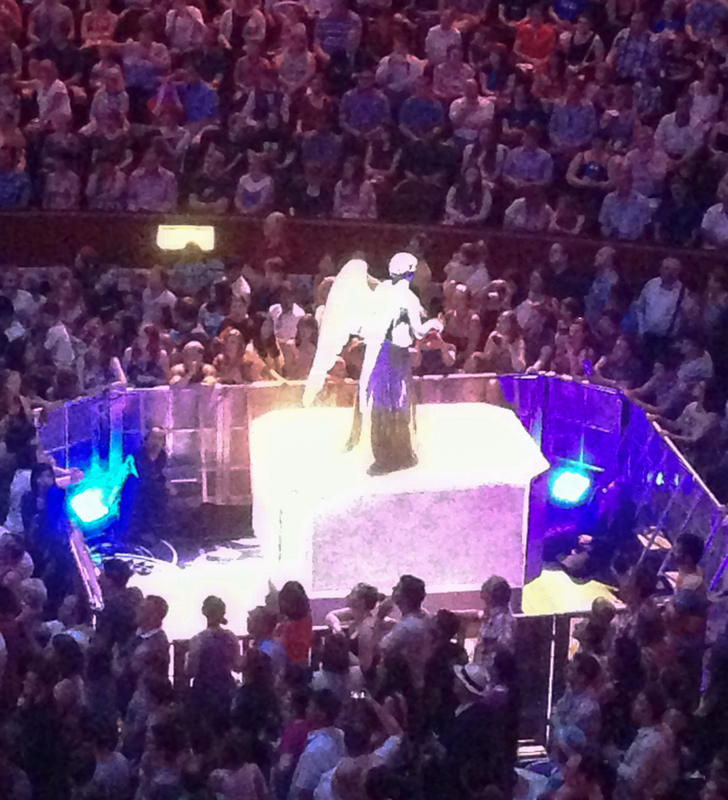 But I digress… this is what the Royal Albert Hall looked like from my seat. You can see that the stage is large enough to hold the BBC National Orchestra of Wales, conducted by Ben Foster. 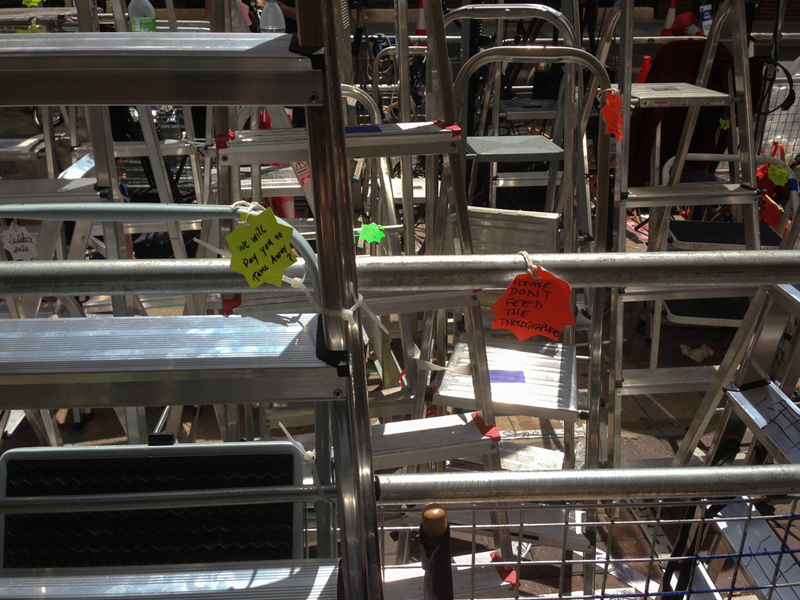 There were racks of seats behind the orchestra for the London Philharmonic Choir. I cannot begin to describe how amazing they sounded together live. The acoustics in the Royal Albert are absolutely brilliant. 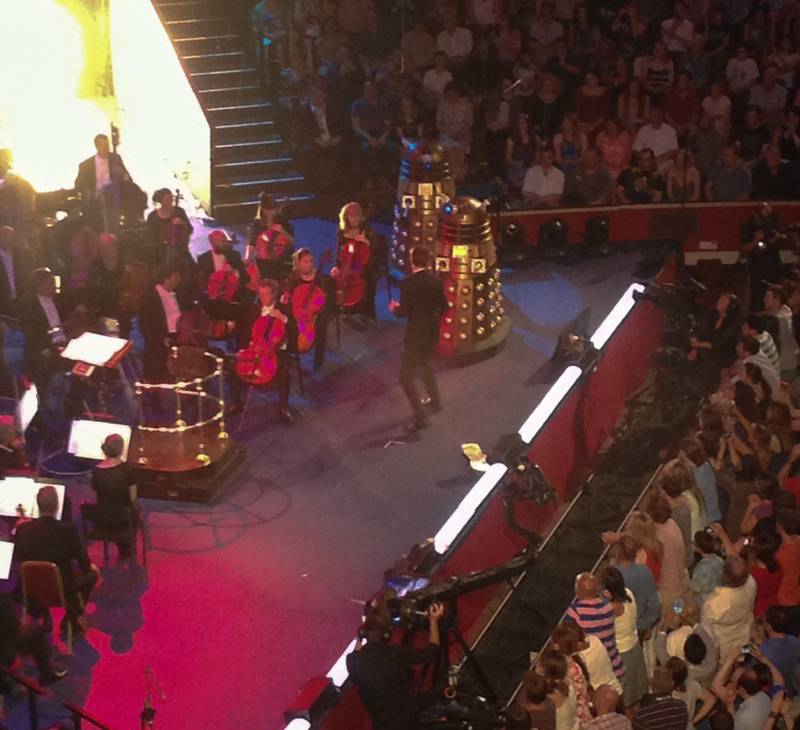 …and here’s the conductor being harassed by a pair of Daleks. The Proms were amazing, and if I lived in London, I would go to a lot more of them. Some of the other Proms this year sounded really nifty. After the show, I headed back to the hotel and had a nice room service sandwich to wind down. 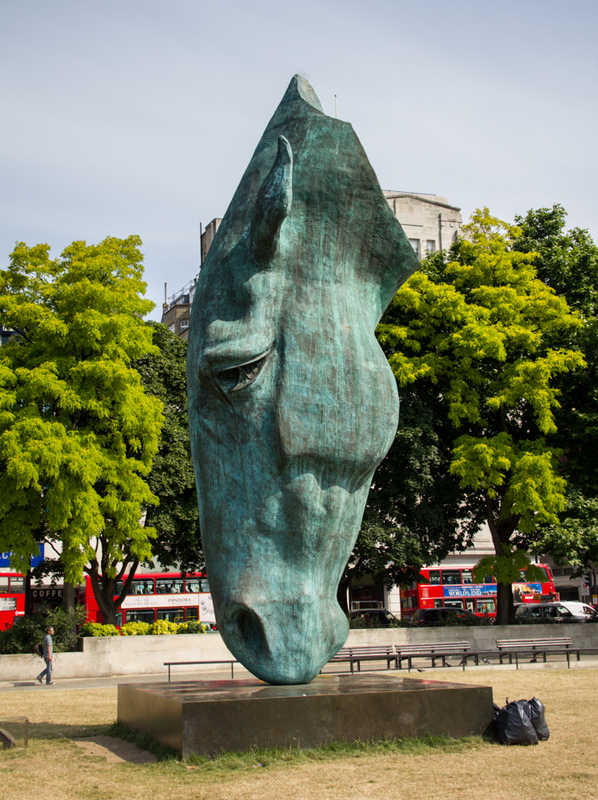 On Sunday morning, I met Neo again, this time at Hyde Park, because there was a giant horse head statue I wanted to check out. I had seen it from the window of the taxi two evenings before. In the darkness, it looked like a giant glowing horse head, and I was pleased to find that it wasn’t that difficult to find in the daylight either. This 35 foot tall horse head statue was sculpted by Nic Fiddian-Green, and it’s been there since around 2009. 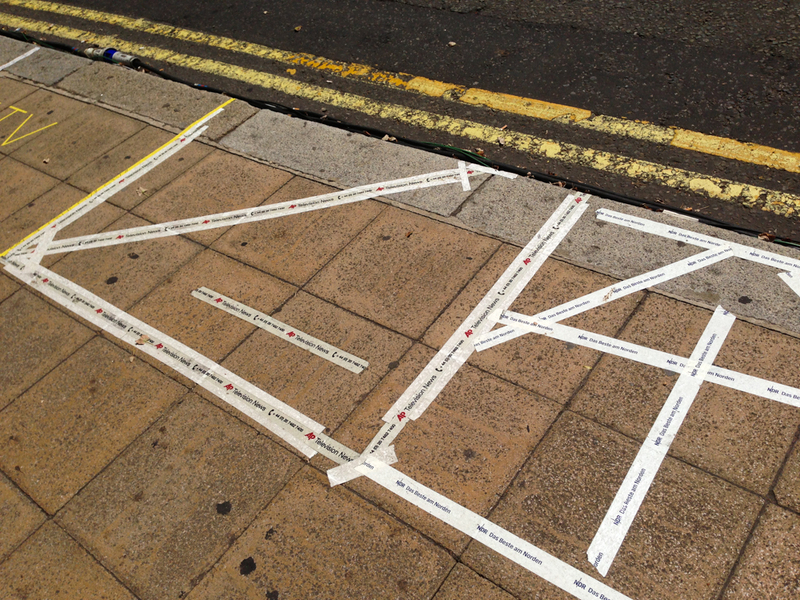 …and just past the already set up tv crews, there were squares of tape which dictated where other camera crews from different media outlets could set up. We had stumbled onto the journalist area for the media crews covering the birth of Kate Middleton’s royal baby at St. Mary’s Hospital in Paddington. I didn’t even know this was going on, but there it is. Tell me your favorite thing to do in London. 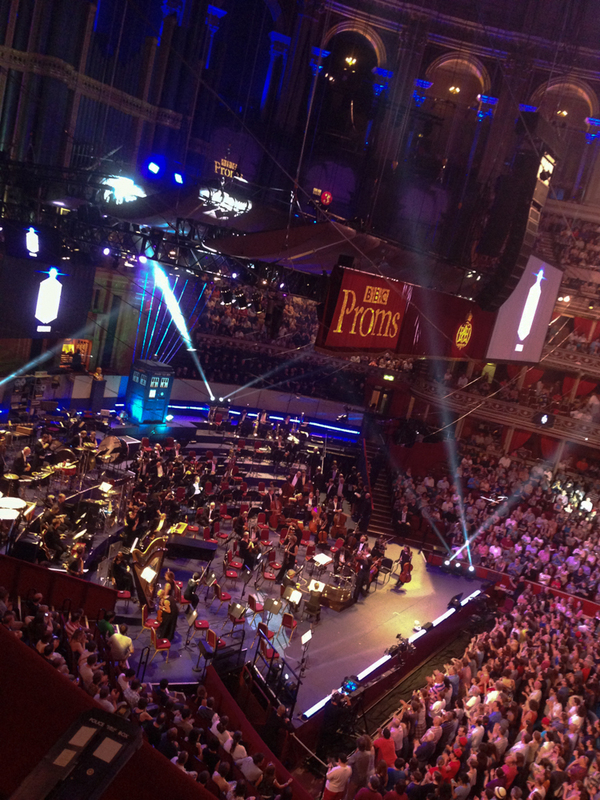 Have you ever been to a BBC Prom? Have you ever accidentally stumbled across a major media event? 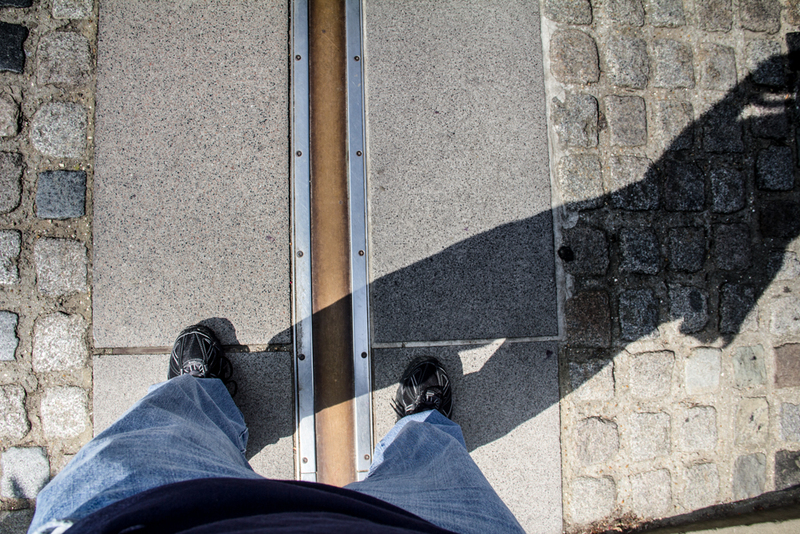 Have you ever stood on the Prime Meridian?